These Zucchini Fritters take less than 15 minutes to make and involve only a handful of simple ingredients. It’s hands down my favorite way to make zucchini! 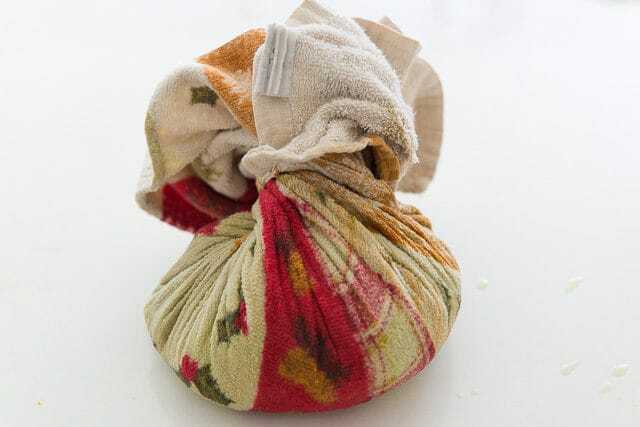 I wouldn’t say that I’m a budget shopper, as there are some serious penny-pinching gurus who can make full meals for some crazy small amount like $2. But, my grocery trips do revolve around what’s on sale. Sometimes I’ll go in with a list, but most of the time what I walk out the door with is totally dependent on what’s on sale. Summer is almost here and the zucchini is cheap. My vegetable drawer the past couple weeks has been half full of zucchini, and lately I have been turning them into these fritters, which I have been eating again and again. I love eating them as a mid-day snack or appetizer for dinner, but baby James happens to love these too, any time of day. Healthy means different things to different people, but I consider this to be a relatively healthy way to prepare zucchini. 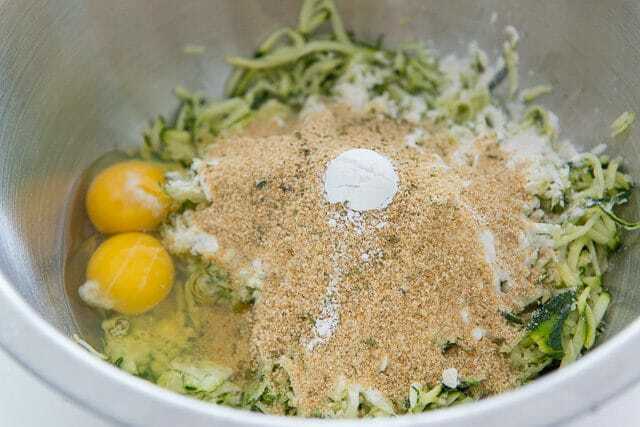 The bulk of the fritter is shredded zucchini that’s been squeezed of its water, with a little bit of flour, bread crumbs, and egg to bind. It’s then pan-fried in olive oil until crispy. (And pssst, if you like these fritters, you might like these Crispy Quinoa Cakes, which are made in a very similar way). 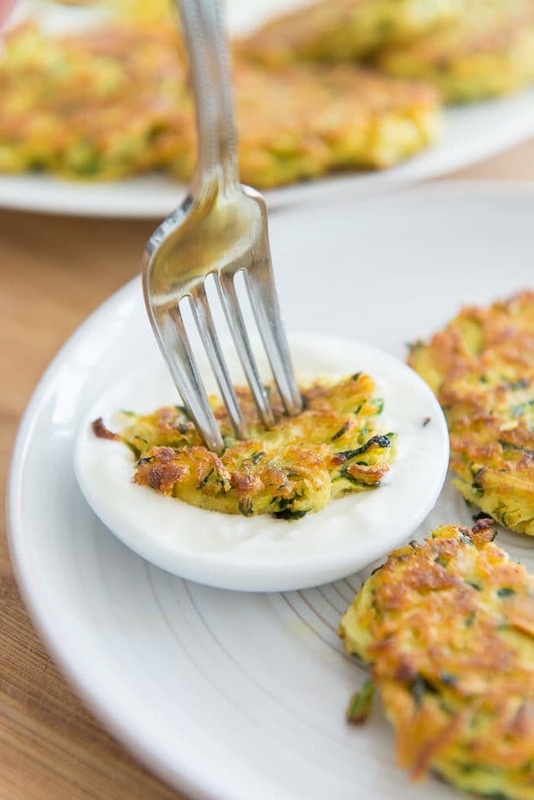 I think the zucchini fritters are fantastic on their own, but sometimes if I have plain yogurt, I’ll dip it in for a little tanginess to go with it. To get started, shred some fresh zucchini. 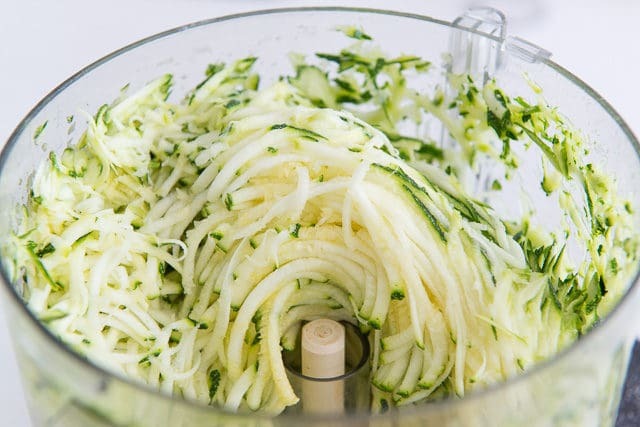 As far as how to shred the zucchini, I think the quickest and easiest way is to use a food processor with the shredding blade, if you have one. However, this morning I made these fritters and my food processor was dirty, so I used one of these handheld cheese graters I have, and it really didn’t take long. Because zucchini is so water-heavy, it grates so easily! Now it’s time to squeeze as much as moisture as we can out of the zucchini. And you’ll be pretty amazed by how much moisture comes out. 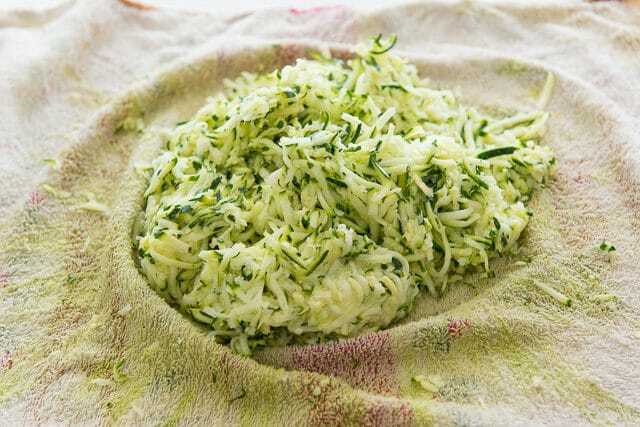 Quick note: a lot of shredded zucchini recipes call for salting the zucchini and letting it “drain” for 10 minutes before squeezing, but honestly I have never found this to make a difference. Really. And I’ve never had any issues with the fritters being soggy. So if you prefer to salt and drain, go ahead, but I just skip it. Serve the fritters with yogurt, if desired. Sausage Stuffed Zucchini Boats, Greek Zucchini Salad, and Zucchini Ribbon Salad are some of my other favorite zucchini recipes. 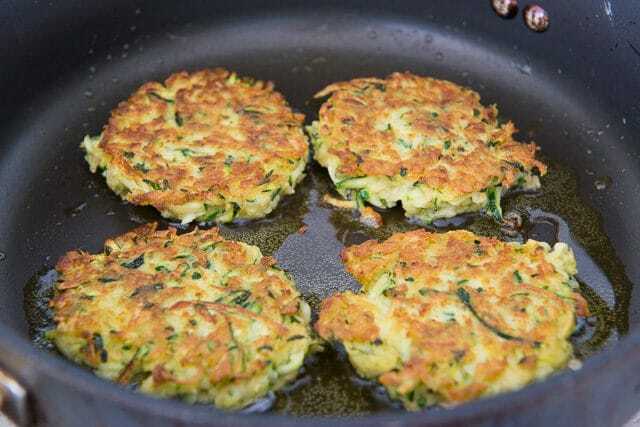 How to make sure the zucchini fritters are crispy: You want to use enough olive oil that the bottom of the pan is coated, and there is oil around each fritter. Otherwise the fritters won’t get crispy. I usually use between 6 and 8 tbsp total for frying, but use what’s needed. How to reheat zucchini fritters: Place on a sheet pan and reheat in a 375F oven for about 10-15 minutes, until warmed through. 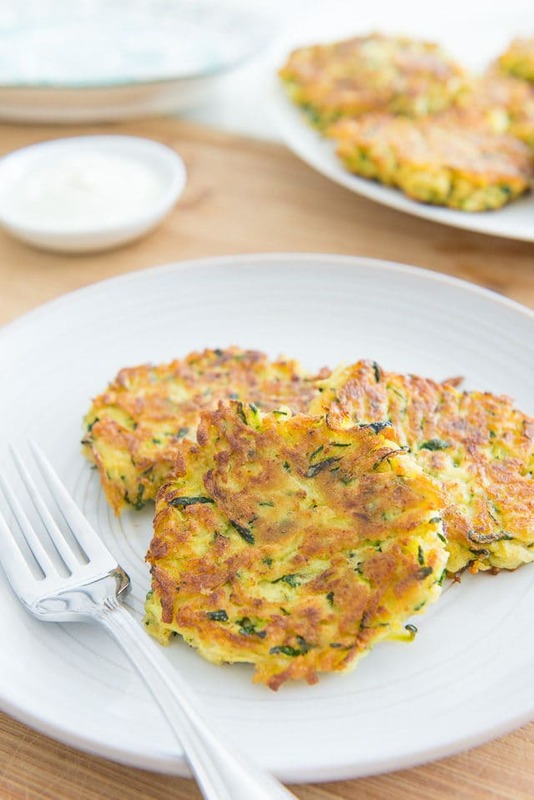 Can you freeze zucchini fritters? Yes! 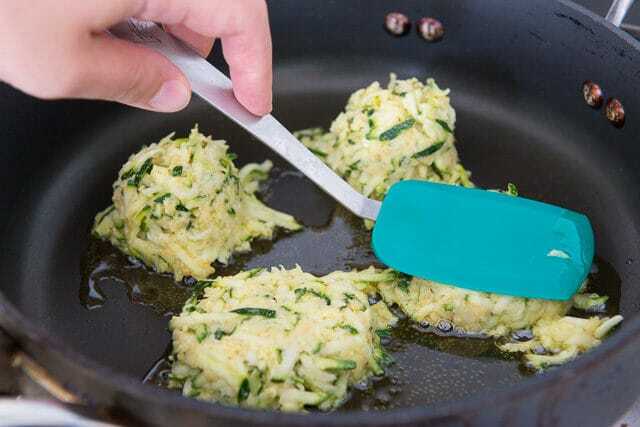 Place cooked and cooled zucchini fritters into a ziptop bag and freeze for 2 months. Thaw before reheating. How long to refrigerate zucchini fritters: I find these will keep in the refrigerator for 4-5 days. 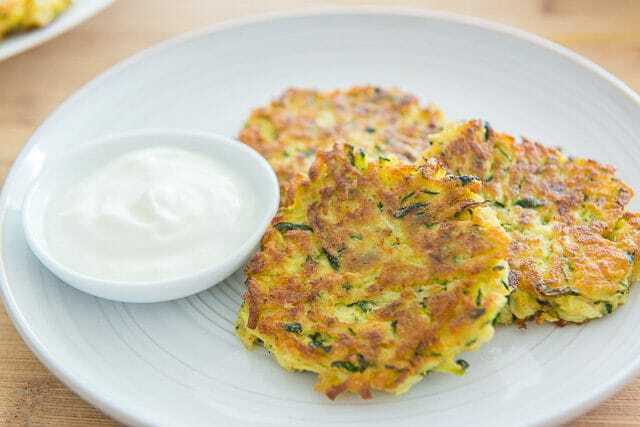 How to serve zucchini fritters/what do dip zucchini fritters in: I like to eat these as is, but you can also add a little sprinkle of sea salt on top, or dip into plain yogurt. If you want to jazz up the yogurt a little bit, you can add minced garlic, fresh lemon juice, and herbs like dill or parsley, to taste. Don’t overcrowd the pan: If you have a really big nonstick pan (I just bought a huge one) and a decently powerful range, you might be able to fry these all in one batch. Just make sure there’s a little bit of room around each fritter so they can crisp properly. Make the number of batches according to the equipment you have. Shred the zucchini. My preferred method, which I find to be the easiest and fastest for shredding zucchini, is to use the shredding blade of the food processor. You can also shred by using a box grater. 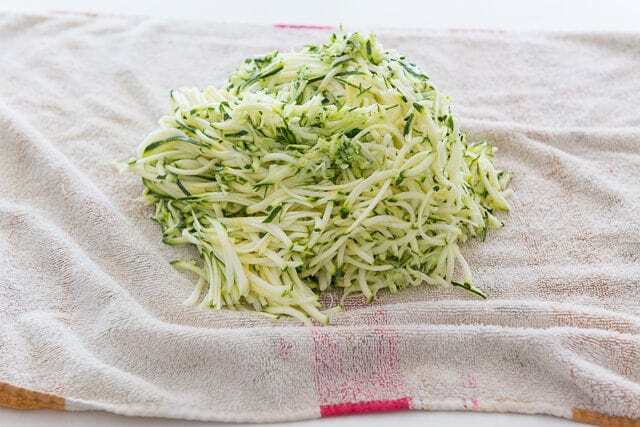 Place the shredded zucchini into a thin kitchen towel and squeeze as much water out as you can. 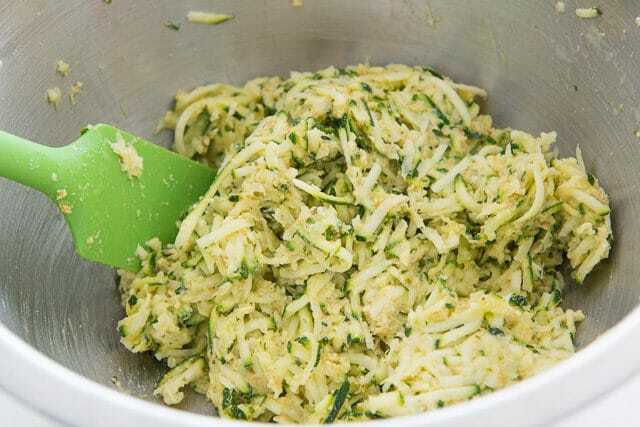 Place the squeezed zucchini into a bowl and add all the remaining ingredients except the olive oil. Lightly scramble the eggs in the bowl, then mix everything well until the mixture is moist and all ingredients are distributed. Heat a nonstick skillet over medium heat, and add 3 tbsp of olive oil. Use a 3Tbsp cookie scoop to portion mounds directly into the pan, then gently press down with a turner to flatten. 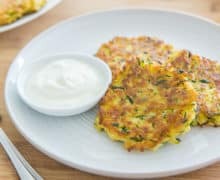 Fry the zucchini fritters for about 4 minutes on the first side, and 3 minutes on the other, or until golden brown on each side. Enjoy while hot! Post updated in October 2018. Originally published June 2017. This post contains an affiliate link. Your zucchini recipes are just amazing. My son absolutely loves them. Thank you for posting such wonderful recipes. You are a saviour! These are truly awesome! I add about a tbsp of chopped onion and a medium sized chopped garlic clove. I nuke that for 3-5 minutes to soften them and add to the mixture.